The Real Jenn C.: Flying High with Sean Penn / Karen's Wedding! Hollywood bad-boy Sean Penn was on our flight from Santa Anna to Austin last night. He looks the same in person as he does on the big screen, only smaller. We went west primarily for my friend Karen's wedding. I met Karen at freshman orientation at the University of Texas in the summer of 1991. She was cool. She knew about bands. She went to clubs. I didn't believe her when she said she would find me in the fall. She did! We were inseparable for two years until she took a break from school, and moved to New York City. We lost touch for a few years, then bumped into each other in Austin at the movies one Friday night. Boom -- fast friends again. We've stayed in touch ever since. Chad and I arrived in LA Wednesday afternoon, staying at the lovely and eco-friendly Ambrose Hotel in Santa Monica. Karen waited tables at the restaurant Real Food Daily when she first moved out to LA ten years ago, so that's where we had dinner. It was fun to see where she worked, and the vegan menu was really/surprisingly yummy! After dinner, we saw my favorite band, NadaSurf, with another good band, Sea Wolf, at The Music Box (a.k.a. Henry Fonda Theatre) on Hollywood Blvd. The Music Box features velvet curtains and a roomy, raised stage. The theatre has art nouveau touches like scrolly gold columns flanking box seats on either side of the stage. The venue lends a real sense of credible theatrical performance since the audience doesn't have to watch the band scramble to set-up and tune their instruments. The curtains come up with a sense of ceremony, and the band starts to play. Both bands delivered solid shows. Oddly, both bands featured cello players which added a real depth to the music. I did the silly bounce at the knees and bop your head dance to every song. I was that dorky girl that sang along. Friday's main event was Karen and Matthew's wedding. I'm so happy that Karen and Matthew found each other! Their wedding was gorgeous and fun, just like they are. 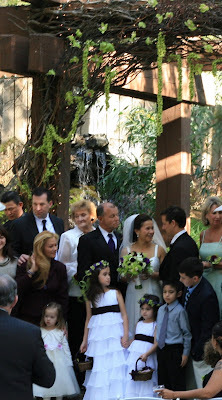 The ceremony was outside under a perfect Malibu sky. I cried like a baby to see my longest-lasting, and delightfully wildest, friend joining her soul-mate in holy, monogamous matrimony. In short, the wedding was relaxed, joyful and perfect from a guest's perspective.